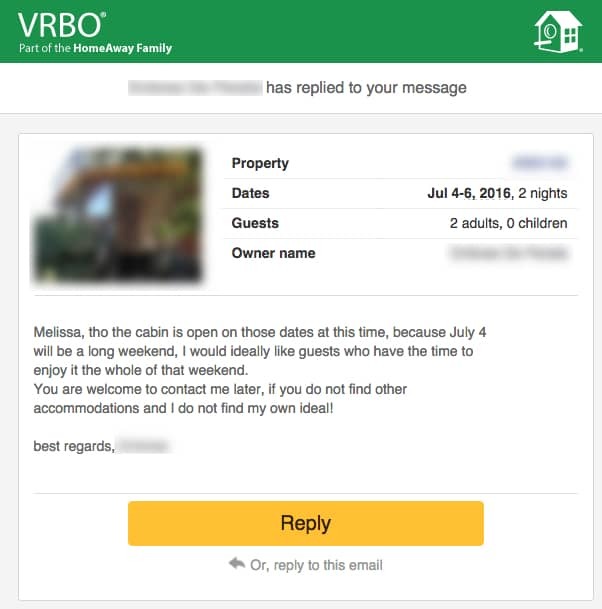 My Disappointing Experience (x3) Trying to Use VRBO. Ken and I are planning a trip to San Francisco in the summer. One of Ken’s friends is getting married in the Bay Area, and we decided to make a vacation out of it. The original plan was to do four nights in San Francisco, as well as four nights in the Monterey Bay or Big Sur area. Hotel options in the Monterey and Big Sur area seem fall into three categories: 1) Lower end chain hotels far from the beach and other scenery, 2) Uber budget motels that would have been fine for my taste 8+ years ago, but no longer, and 3) Ultra high-end expensive beach front hotels for $300+/night. Many $600+ per night. Yikes. So, I decided to look for vacation rentals on VRBO. After a bit more itinerary finagling, we decided on two nights in Santa Cruz and two nights in Big Sur. We limited our search to properties that allowed a minimum of two night stays (since many properties have minimums of 4+ nights). We found a few properties that looked fantastic, weighed the pros and cons, made our choice, and reserved it. Done and done. First message we got was from our reservation in Big Sur. Second, we got a message (err, a lack of a message) for our reservation in Santa Cruz. 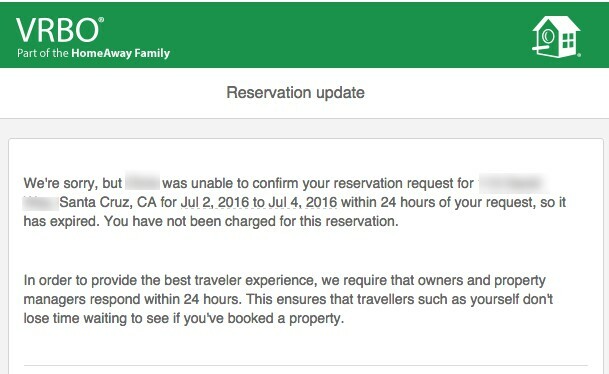 The property owner never responded within 24 hours, so our reservation was automatically cancelled. I sent the owner a separate follow-up message, and he just responded vaguely saying that the property wasn’t available those days. I continue to re-check, and it’s still available according to the calendar for that property on VRBO! So, we decided to readjust our strategy. I booked two nights at a chain hotel, the Highlands Inn Carmel, which is a Hyatt property. 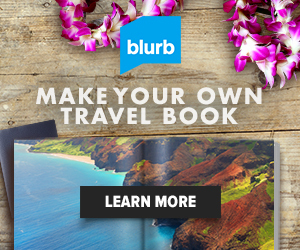 So I was able to use Hyatt Gold Passport points for a hotel near Big Sur. Score! 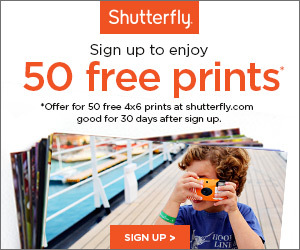 Saving money, saving money! We just had to find another Santa Cruz property. We decided to submit another VRBO reservation for another lovely looking home close to the beach in Santa Cruz. This one also had two night minimum stays. And another one, now our third, rejected. She responded saying she has strict three-night minimum stay requirements during the summer. Again, nowhere on the property page was that indicated. Just the two night minimum stays. We were beyond frustrated. And frankly, it makes me hesitant to try VRBO again in the future. I spent a decent chunk of time researching and comparing properties before submitting reservations on VRBO. But it was all a total waste of time. So, why would I spend time in the future searching for properties that fit my criteria, only to have them rejected? I hate to be whiny over such #FirstWorldProblems and all, but seriously, this is a vacation rental business. I expect to be able to RENT VACATION HOMES! I’m not sure who is at fault – the property owners or VRBO? Maybe VRBO makes it difficult to alter minimum stay requirements on their website? 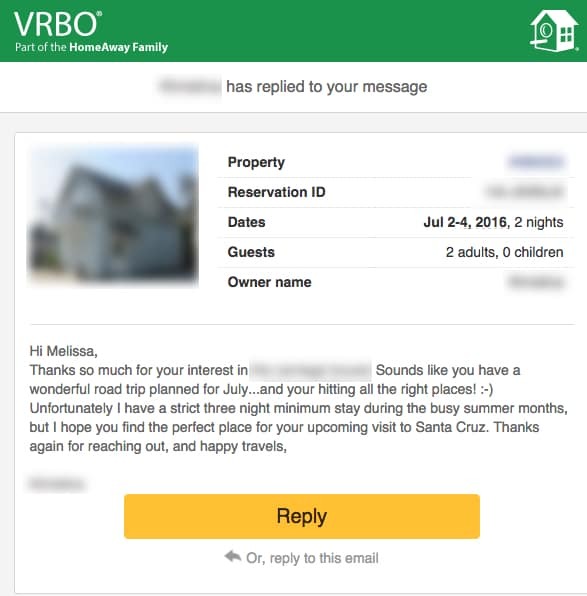 Maybe there are additional charges that VRBO imposes if you have longer stay requirments? Or maybe it’s just flaky owners. Hoping a “better” guest will come around and stay longer at their property? Have you used VRBO? What were your thoughts? I’ve been searching VRBO for a stay in San Diego this summer and have already run into one of the problems you had last year- namely the mysterious minimum stays that for some reason are not listed on the VRBO listing page. I agree that it’s frustrating to put all this time and effort into research and putting a good faith offer to book out there only to have it rejected for what seems to be a bogus reason. I know others have had good luck with VRBO but I am about ready to say forget it and just go back to a regular hotel or maybe a mom & pop motel. I own a VRBO rental! I keep my rates the same for the entire year and welcome guest for at least one night! Try airbnb, they do not charge as many fees to the guest or to the homeowner. good luck!